About Something Good Publishing is a small boutique publisher looking to publish books with a positive lesson for today’s world. Ralphie had been returned to the shelter three times when Andrea Yerramilli and her husband adopted him. He was rambunctious and hyperactive, it was by no means certain that he would ever be appreciated for the loving dog he was. But when he was taken home to a loving environment, understood, redirected, taught, and accepted, he learned fast. 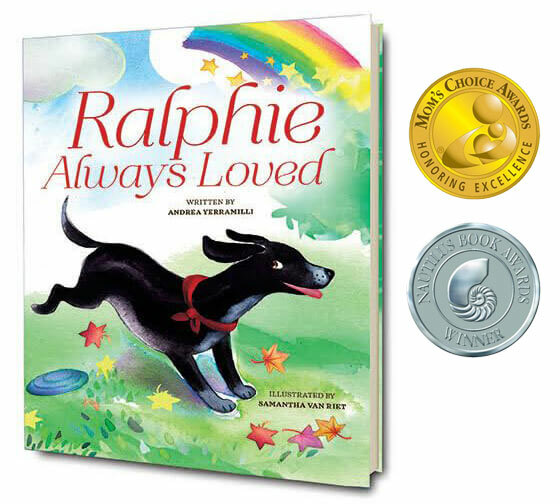 As the family grew, so did Ralphie’s capacity for love and the ways he expressed it. Through additions to the family, and losses, he remained both loving and loved until, as a grand old dog of sixteen, he touched the hearts of the whole neighborhood. Ralphie, Always Loved tells Ralphie’s story. It will reach deep into the corners of your heart, remind you of all that’s good, and reaffirm your belief in the power of love to transform and uplift throughout life’s cycle of birth, growth, maturity, and death. Beautifully illustrated in full color, the book celebrates a dog who perfected the art of loving, and the family who loved him.